CWC Group has supported the Nigerian Business Coalition Against AIDS (NiBUCAA) for over five years now. We have been an active member of the coalition as we share NiBUCAA’s belief that the private sector should respond to the growing challenges of HIV/AIDS ensuring equal rights and opportunities for employees infected or a‑ected by the virus. 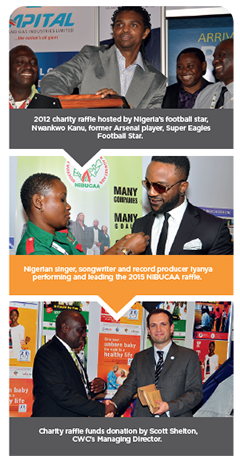 Organization, funding and publicity of the Annual NiBUCAA Charity Raffle taking place at the Nigeria Oil & Gas Conference & Exhibition, and regularly hosted by country’s favourite athletes, comedians and artists. This is a very important initiative and one we are extremely proud to support. Given our long history of working in Africa and out extensive local contacts we are keenly aware of the impact of HIV and AIDS within the region. In partnership with the Nigerian Content Development & Monitoring Board (NCDMB) and the Bayelsa State Government, CWC Group has developed the annual Practical Nigerian Content Youth Workshop. 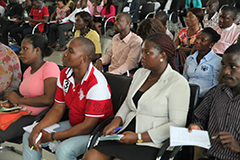 Working closely with local youth groups and societies, student organisations and professional associations, the Youth Workshop brings together over 300 Bayelsan graduates from across the state to this free-to-attend forum. In a country with an unemployment rate as high as 23% for graduates, and close to 60% youth unemployment in rural areas, the Youth Workshop provides a valuable platform for local youths to hear from respected figures within business, industry and academia, providing them insights and useful tools to help them enter the oil and gas industry, or launch their own businesses, capitalising on the opportunities present in their own communities and Bayelsa as a whole. The Workshop also highlights further training opportunities available as well as initiatives provided by local government and the NCDMB that will enable them to further enhance their employment prospects. Leveraging on CWC’s close relationship with the Nigerian Business Coalition Against AIDS (NiBUCAA), the workshop also provides an opportunity to o‑er free HIV/AIDS testing to attendees.